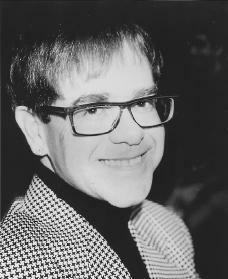 Once famous for his flashy clothes and string of hit records, English rock musician Elton John has more recently become a humanitarian (one who works to promote human welfare) with a particular interest in supporting acquired immune deficiency syndrome (AIDS; a disease that destroys the body's ability to fight infection) charities. Elton John was born Reginald Kenneth Dwight on March 25, 1947, in the town of Pinner in Middlesex, England. An only child who was overweight and wore glasses, he was afraid of his father, a squadron leader (a ranking officer) with the Royal Air Force, whom he described as "very snobbish and sort of stiff." His mother Sheila, on the other hand, brought home records that introduced him to rock music. John taught himself to play the piano at the age of four. He studied at the London Academy of Music but quit two weeks before graduation to pursue a musical career. He worked for a music publishing company and also played the piano in bars, later joining a band called Bluesology. He created his stage name as a combination of the middle name of Bluesology's singer, Long John Baldry, and the first name of the saxophone player, Elton Dean. Later in his life, John added the middle name Hercules. In 1968 John met Bernie Taupin (1950–), who became his long-term song-writing partner. John's first album, Empty Sky (1969), was a commercial failure. His second album contained "Your Song," a hit in both the United States and England. In 1972 "Rocket Man" became his first number-one single in America. Other hits followed, including "Daniel" and "Crocodile Rock" from the album Don't Shoot Me, I'm Only the Piano Player. The album Goodbye Yellow Brick Road (1973) contained "Candle in the Wind," written about actress Marilyn Monroe (1926–1962). That same year, John launched his own record label, Rocket Records. John became famous for his oversize glasses and outrageous outfits. He was called the "Queen Mum of Pop." He also enjoyed many expensive cars, large homes, and shopping sprees. In 1975 he starred as the Pinball Wizard in the film version of the rock opera Tommy. In 1976 a duet with Kiki Dee, "Don't Go Breaking My Heart," became his first British number-one single. His popularity then began to decline after a series of less successful albums. Admitting that he was attracted to both men and women further damaged his popularity, and he began abusing alcohol and drugs. Although John continued performing during the 1980s, his drug and drinking problems had caused him to lose his magic touch. While recording Too Low for Zero in 1983, John met Renate Blauel, a German-born, recording-studio worker. They were married on Valentine's Day (February 14) 1984. The British press attacked both the marriage and John, focusing on his sexual history. After less than five years, the couple agreed to divorce. In the early 1990s John received treatment for alcoholism, drug abuse, and bulimia (an eating disorder). He admitted he was a homosexual (a man attracted to other men) and began to devote his energies toward helping others. Starting in 1990 he donated all of the profits from the sales of his singles to charity, mostly those associated with AIDS. In 1992 he established the Elton John AIDS Foundation. In 1994 he was elected to the Rock and Roll Hall of Fame, and in 1995 he won an Academy Award. In 1997 John was shaken by the death of his friend, Diana, Princess of Wales (1961–1997), in a car accident. John performed a new version of "Candle in the Wind" at her funeral. It sold more than thirty million copies after being released as a sigle. John donated all of the profits (more than $47 million) to the charity established in Diana's name. He was knighted by Queen Elizabeth II (1926–) for his achievements in music and contributions to charity. In 2000 the National Academy of Recording Arts and Sciences honored John as Person of the Year for his charity work. Later that year, John and lyric writer Tim Rice wrote songs for the Broadway musical Aida (which won a Tony award) and the film The Road to El Dorado. John also sued the accounting firm (a company paid to verify and calculate business dealings) PriceWaterhouseCoopers and his former manager for $29 million, claiming they had stolen money from him. John won a Grammy Award for best musical show album for Elton John and Tim Rice's Aida in February 2001. At the award show he performed with rap artist Eminem (1972–), angering homosexual rights leaders who had criticized Eminem for his antigay lyrics. Later that year John released Songs from the West Coast, which many praised as a return to his "1970s sound." Bernardin, Claude, and Tom Stanton. Rocket Man: Elton John from A-Z. Westport, CT: Praeger, 1996. Cassata, Mary Anne. The Elton John Scrapbook. New York: Citadel Press, 2002. Norman, Philip. Elton John. New York: Simon & Schuster, 1993. Rosenthal, Elizabeth J. His Song: The Musical Journey of Elton John. New York: Billboard Books, 2001. Elton John is amazing! I loved his colaboration with Lady Gaga. He's an inspiration, and he's done so much to help so many charities! Keep rockin'! I have loved Elton John since the 6 th grade, and I'm 59 years old now. My childhood fantasy was to marry him! Even when people scowled me and said he was homosexual. I still was going to find a way to marry him. I've been to many concerts, and raised my daughter on Elton's old " yellow brick road" album. This past September she took me to see him in DC for GOOD BYE YELLOW BRICK ROAD" final tour. Had the bbest time of my life!!! I will always be madly in love with his music and his giving personality.